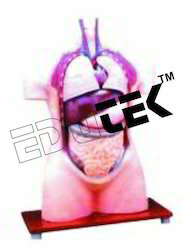 We are Manufacturer and Exporter of Anatomy models. 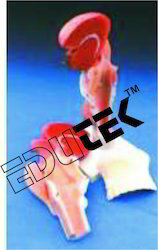 We suppling Anatomy models in colleges, Schools and medical institutes. 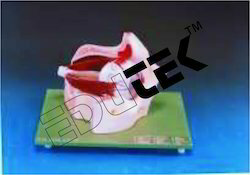 The wide range of Anatomy Models offers includes Brain Models, Breast Models, Dental Models, Digestive System Models, Ear Models, Eye Models, Genital and Pelvis Models, Head Models, Human Heart Models, Human Skeleton Models, Human Skull Models, Human Spine Models, Human Torso Models, Joint Models, Lung Models etc. Made of unbreakable materials, robust construction, with fast natural colours. Parts are easily removable to facilitate teaching. Full size, 10 parts, without sterno - abdominal wall but with ribs, sternum and clavicle with their attachments. Thoracic and abdominal organs, individually detachable lungs, stomach, liver, intestine, heart, which is further sectioned in two parts. Half of skull cap is removed, and brain can be taken out, exposing the interior of the skull. 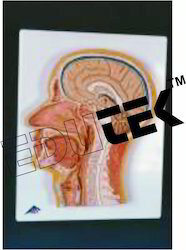 Sectioned head and neck depicts internal organs of the region, sexless, on base, with key card. 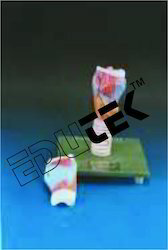 Similar to cat no B12022 but without head. Dissectable into 6 parts, on base, with key card. 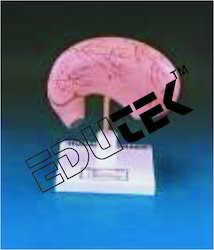 HUMAN HEAD AND NECK L. S.
7-part model. 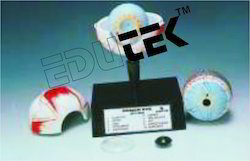 The upper half of the sclera with cornea and eye muscle attachments, both halves of choroid with iris and retina, lens and vitreous humour are removable, mounted on stand, with key card. An highly improved and enlarged model showing fine details in three dimensional relief. Cut in horizontal plane and separable in seven parts. After removing the upper half of the sclera (outer shell), the choroid with its verticose veins is exposed; with the removal of second shell, details of the retina come into view and the position of the yellow and blind spots is quite visible. All important anatomical features such as muscle insertions, optic nerve, blood vessels, ciliary body, cornea, crystalline lens, and iris etc are clearly numbered and are identifiable. Mounted on base, with key card. A 3 times enlarged model of the eye, with 9 parts, in bony orbit. The upper half of eye ball is removable and dissects into 7 parts, showing all anatomical details. Out of six muscles controlling the eye ball two are removable. On base, with key card. A 5 times enlarged model of the eye, sectioned horizontally, dissects into 7parts, the upper half of the sclerotic membrane, two choroid membranes, retina with vitreous humour, lens and lower half of the sclerotic membrane. On base, with key card. 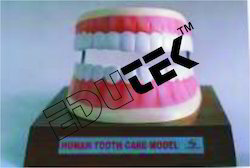 An enlarged model to demonstrate dental care with normal size brush, on base with key card. 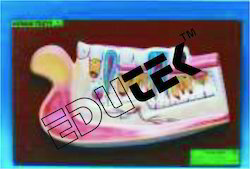 Greatly enlarged, internal wall is removed to show the incisiors, molars, permanent canine and permanent serving them, on a large size board, with key card. 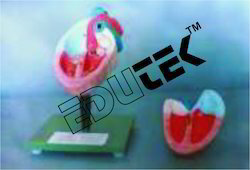 Enlarged model, dissectable in 2 parts, with detachable teeth of lower jaw, on base, with key card. 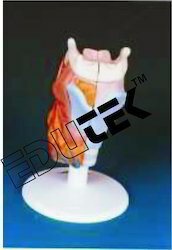 Natural size, 2 parts, shows larynx, wind pipe, ligaments, muscles and thyroid gland, one half is removable, on base, with key card. Similar to cat. no. B12102 but dissectable into 3 parts. Larynx showing cartilages, ligaments, muscles, relief of mucous membrane and thyroid gland. Dissectable into 2 parts showing all the important details, on base, with key card. 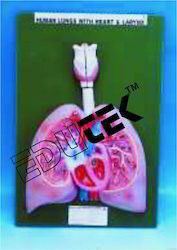 Full size, 7 parts, shows 2 part removable larynx, wind pipe with bronchial tree; 2 part removable heart, subclavial artery and vein, venacava, aorta, pulmonary artery, esophagus, 2 lungs with removable front halves and diaphragm, on base, with key card. 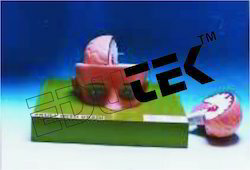 Natural size, the front heart wall is removable to view the chambers, on stand, with key card. Extra large size and highly detailed model carefully coloured and finished. The heart is cut into 2 parts by a vertical line towards the level of the ventricular septum and separates into 2 parts after the arch of aorta and superior venacava have been removed. Both auricles and ventricles with the bicuspid and tricuspid semilunar valves as well as the sigmoid valves can be seen. Separates in 4 parts. 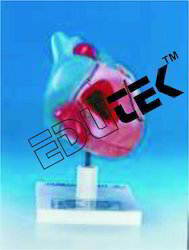 On base with diaphragm and outline of the pericardium, with key card. 3 times enlarged, dissectable into 4 parts, showing clearly both ventricles and atria open to expose the valves. 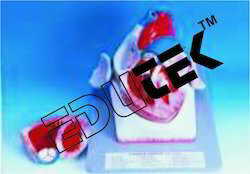 The chief blood vessels and musculature of heart are shown, on base, with key card. Three times enlarged, dissectable into 3 parts, sectioned through the ventricles and auricles. 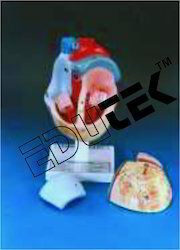 The bicuspid and tricuspid semilunar and sigmoid valves are shown, on stand with key card. Three times enlarged, dissectable in two parts, on stand. Large size, showing external details, mounted on stand, with key card. 2 parts, shows stomach with cardiac portion, mucosa of stomach and vessels. The front stomach is removable to observe the interior view.